Twenty down. Thirty five to go. 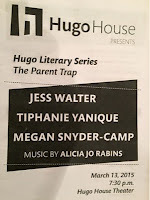 We weren't sure what to expect when we showed up for The Parent Trap at Hugo House on Capitol Hill. Before the show, Hugo's director Tree Swenson told us not to worry: they're never sure what will happen at these events either. You see, in Hugo's Literary Series, authors read new works written in response to a prompt cooked up by the Hugo House staff. That makes it particularly fun and engaging. The "Helicopter Parenting" theme seemed a perfect (but perhaps somewhat brave) choice for an outing with our eldest daughter, herself a parent and a psychologist who directs the infant and child program at a local non-profit. As Swenson predicted, The Parent Trap went in unexpected directions. The three writers explored the complicated landscape between parent and child far beyond the current discussion of "helicopter parenting." Their works were a compelling and often humorous celebration of its beauty and pain. Musician and prize-winning poet Alicia Jo Rabins performed several original works including a wonderful love song she wrote for her baby. It got an emotional response from at least one grampa and one young mom in the audience. Hugo House is a place for writers. It is also a place for all who love the power of language and are energized by the company of writers as they create and share new work. Drawing on a faculty of over forty – each with impressive credentials in writing, teaching and editing – the House offers up to eighty classes and workshops every quarter on a myriad of topics designed to help writers generate new work and improve their craft. 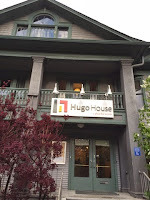 The classes and workshops, however, are just the start at Hugo House. An innovative teen program provides opportunities for young writers to find mentors, develop leadership skills, and create and present their work. There are workshops where teachers bring students to the House, and a fellows program to support writers age 35 and younger. In addition to the Literary Series, one can learn writing skills at the Word Works: Writers on Writing events. In the Under the Influence series, you can hear contemporary authors present tributes to their favorite classics. The Cheap Wine and Poetry and Cheap Beer and Prose series pair inexpensive beverages with some priceless writing. 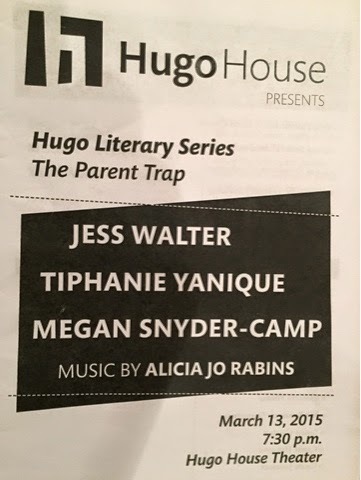 Our night at Hugo House was a perfect example of what I am learning from this project. The arts in our region are full of varied, unexpected and wonderful experiences. partner locations around the city. Nineteen down. Thirty-six to go. There is really no excuse for my prior ignorance about the EMP museum. I literally live in the neighborhood and pass the iconic Frank Gehry designed museum on a daily basis. I've even been inside a number of times over the years, having taken my kids there when they were younger. Still, when I re-visited EMP recently for this blog post, the sheer size of the museum and the variety and quality of its exhibits impressed me as never before. My re-education started when a well-informed friend said, somewhat to my surprise, that he believes the EMP is one of the most interesting and deserving arts organizations his company supports. Then, it continued on a recent Saturday afternoon when I tried to soak up the entire museum (including the Star Wars costume exhibit) in a single visit, and almost immediately found myself stopped in my tracks by Jimi Hendrix's powerful Woodstock performance playing on the huge LED screen. The image was so crystal clear and the sound so incredibly good that of course I watched the entire performance. Realizing there wasn't going to be nearly enough time to do the EMP justice in one afternoon I signed up for a membership and have already been back a second time. The EMP is a non-profit "dedicated to the ideas and risk-taking that fuel contemporary popular culture." Founded by Microsoft co-founder Paul Allen in 2000, the EMP has organized dozens of exhibits, 17 of which have toured in the US and internationally. 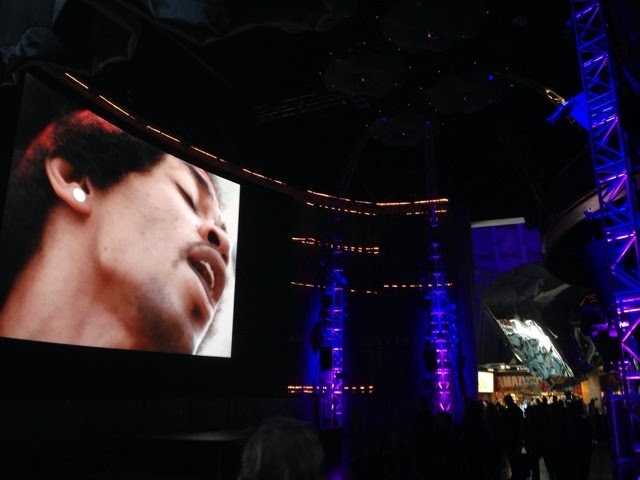 The museum features interactive spaces where visitors can do a hands-on rock and roll exploration, the world's largest collection of artifacts celebrating Seattle musicians Nirvana and Jimi Hendrix, and an impressive mix of educational programming. The education programs include "Creativity Camps" for kids, Teen Artist Workshops, and an annual sci-fi and short story contest for 3rd to 12th graders. The EMP is also, of course, the home of the Science Fiction Museum and Hall of Fame. 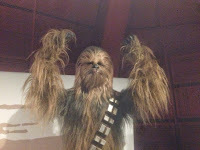 The Star Wars costume exhibit showed the incredible artistry required to create the wardrobe for hundreds of humans and other creatures. The costumes from the original trilogy were the most familiar to me, but the work done on a host of characters for the subsequent movies was perhaps even more impressive. 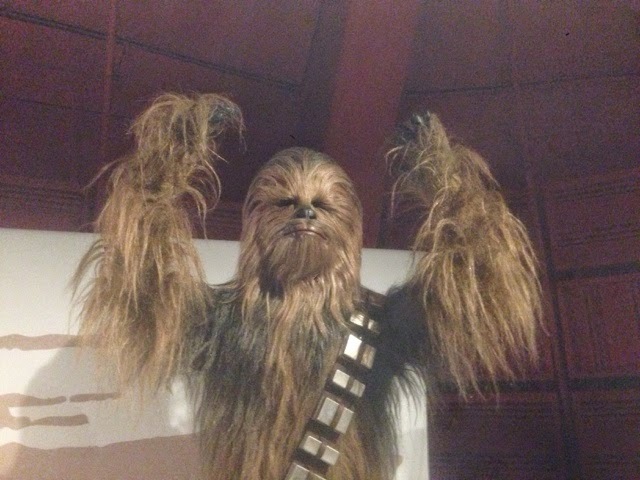 The exhibit also brought to mind Carrie Fisher's description, in her one-woman show Wishful Drinking, of her reaction to the Princess Leia costume and George Lucas's comment that there were "no bras in space." A final suggestion for your EMP visit: A few steps to the north across Fifth Avenue is the Bill & Melinda Gates Foundation's visitor center. It is free of charge and well worth checking out.